This section of the site is provided in partnership with The Swindon Society and The Richard Jefferies Society. 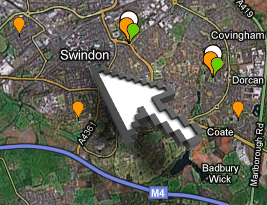 It enables you to see how the surrounding area used to look and learn more about your town. We are adding value by providing a current photograph taken as far as possible from the same position. The project involves a fair bit of detective work, so if you can add or correct information, please get in touch. This is your site, so if you would like to get involved in extending this project, please let us know. Boundary House built in 1894 where Boundary Cottage had stood before. This was the last house of that period to pay its taxes to Highworth rather than Swindon. Standish Villa is now Trenchard House, the HQ of the Royal Air Force's Association in Swindon. Mrs F.M. Watt, Nee Hook, at the gates of Lower Rodbourne Farm, Cheney, Near Swindon was the postal address in 1906. Boxing Day 1905 Jim Hook, extreme left, and Walter in the centre with the gun, at Lower Rodboune Farm in a shooting party. The Ship Hotel on the junction of Birch Street and Westcott Place and with Park Lane and Faringdon Road, was the scene of a murder in 1903. Blunsden Abbey fire on the 22nd April 1904. The Swindon Fire Brigade, under Captain Pritchett and Deputy-Captain Mundy, attempted in vain to put out the blaze, pumping water from the adjacent lake. Occupants of the house were rescued by jumping into blankets from the bedroom windows. Unfortunately the house was completely destroyed. Only some of the external walls remain today, the site later became Blunsdon Abbey Caravans Ltd.